Crossing the geographical milestone of the Antarctic Circle is a moment to celebrate. In this frozen area of extraordinary beauty, powerful orcas and leopard seals patrol the waters, while ethereal snow petrels grace the skies against a backdrop of bristling mountain ranges and surreal icebergs. Threading our way through an intricate system of icy waterways, we aim for the glorious Crystal Sound at the mouth of The Gullet. Get ready for an exciting Antarctic adventure, complemented by powerful whales, shimmering mountain ranges and mesmerising icebergs. An overnight passage along Gerlache Strait delivers us to the stunning Antarctic Peninsula, an ethereal wonderland of vast proportions. Aboard robust Zodiacs, we explore penguin rookeries, historic sites and scientific stations, and cruise up close to intricately shaped icebergs and seals basking on ice floes. Kayakers paddle through narrow waterways, in search of wildlife and serenity. Stepping ashore on the continent itself creates an everlasting memory. Bubble-netting humpbacks deserve a wake-up call, even at midnight! A curious leopard seal cruising amongst spectacular icebergs may mean postponing lunch. Over the next six days a host of choices are open to us and depending on ice and weather conditions, the western side of the Antarctic Peninsula is ours to explore. Our experienced expedition team, who have made countless journeys to this area, will use their expertise to design our voyage from day to day. This allows us to make the best use of the prevailing weather, ice conditions and wildlife opportunities. During this voyage, there will be an opportunity to camp ashore - weather and time permitting. This will give you the chance to sample the style of adventure that Scott, Shackleton and other legendary Antarctic explorers experienced, although with slightly better equipment! Rest assured, our warm and comfortable ship with its hot showers will only be a short distance away! There will be plenty of time to enjoy the sheer beauty and breath-taking scenery of this magical land, with its impressive glaciers and rugged snow-capped mountains. You will have plenty of time to walk on shore amongst the hundreds of penguins, or to enjoy a Zodiac cruise and simply enjoy this wonderful landscape. The Peninsula has a remarkable history and during the voyage, we will learn more about the incredible expeditions to these remote areas and hopefully, you will enjoy the same sense of excitement as many of those early Explorers. 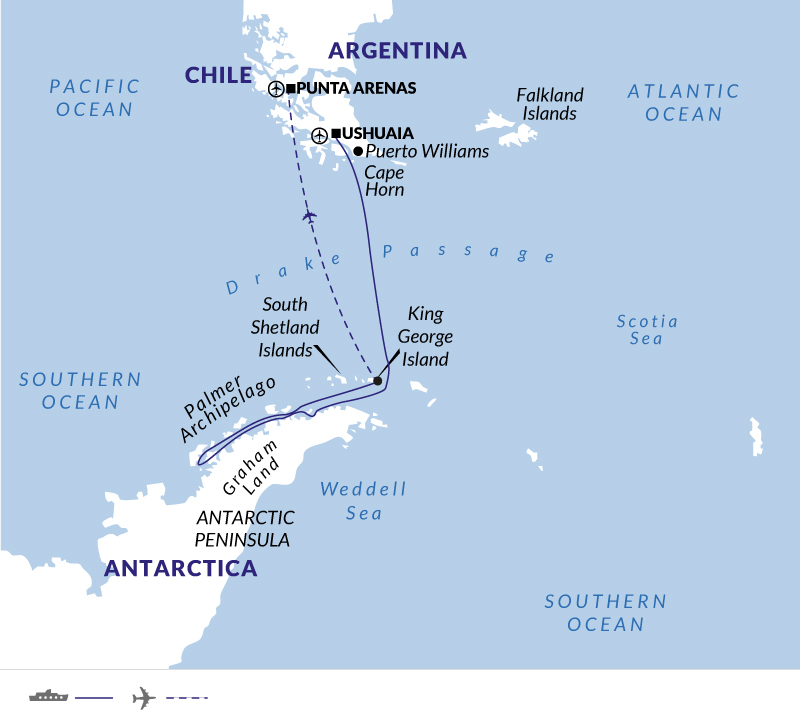 During this voyage, we'll attempt to cross the invisible line of the Antarctic Circle at latitude 66°33' South - this is certainly a special highlight for all of us and we plan to celebrate with a toast on the deck. In order to reach the Antarctic Circle, our ship will motor south every night and during meal times or when we are not ashore exploring. As the Captain steers the ship north across the Drake Passage, we plot a course towards Ushuaia. You will have time to watch for seabirds, enjoy more entertaining talks and exchange photos and stories with fellow passengers. 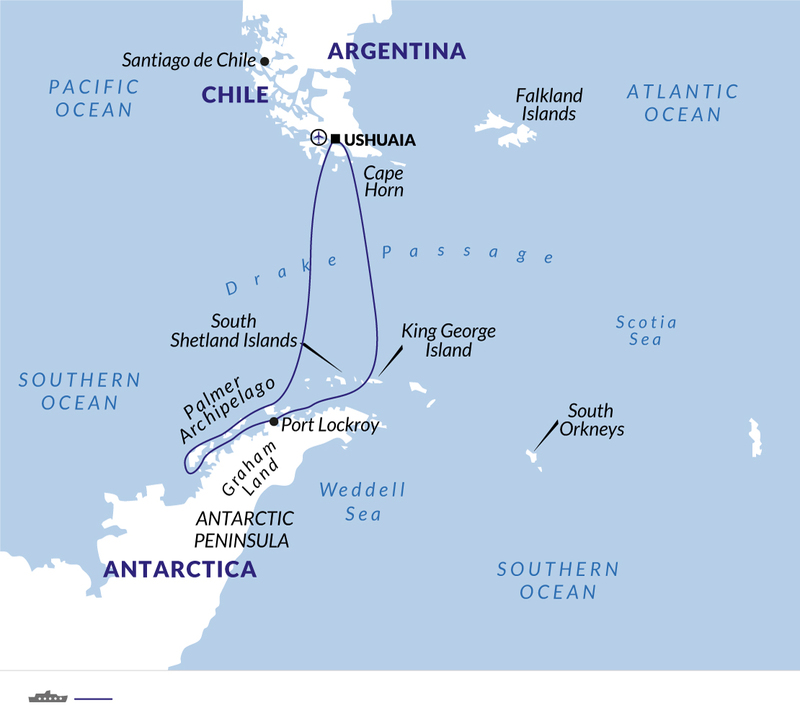 With luck, we may make a ceremonial rounding of Cape Horn, before sharing a farewell dinner with our extended polar family. Your voyage ends in Ushuaia. After breakfast, you will disembark from the ship for onward travel or to savour more time in Ushuaia.